5-in-1 DETACHABLE LENS FOR CELLPHONE AND YOUR TABLETS – INCLUDES – 198 DEGREE FISHEYE LENS, 0.63 WIDE ANGLE LENS, 15X MACRO LENS, 2X TELEPHOTO LENS, CPL LENS. You can enjoy to take more great photos. UNIVERSAL EASY DETACHABLE CLIP WITH HIGH QUALITY GLASS AND LIGHT ALUMINUM ALLOY SHELL- works for the mobile phone like iphone and moto G , samsung s7 edge, Xiaomi Mi5 and etc for the camera lenses diameter under 13mm. EASY TO USE AND SWITCH OUT THE LENSE – great to if you LOVE taking pictures! It is so much fun to play around with the different lenses and see how your pictures can really transform. 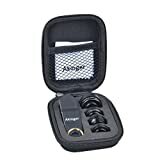 THESE 5 LENSES COMES IN A QUALITY AND NICE BLACK FABRIC COVERED CASE WITH A HOOK- that is lightweight and small enough to fit in a handbag or your pocket. EACH LENS IS COVERED WITH A LENS CAP TO SECURE EACH LENS CLIP IN PLACE OF CASE- it can’t move around in the case for good protect and there is a lint-free microfiber cloth for cleaning the lenses. What’s the 5 in 1 Lens kit? Features: 198° of the scene can be captured by fisheye lens, which takes you into a stunning fantastic world. Note: Be sure that the lens is adjusted right in front of the camera lens of your smart phones, avoiding some blurring photos. Note: When shooting pictures, it is suggested that the wide angle lens be used in a wide-open area in order to get better photos. Note: In order to get a stunning effect when using this Macro Lens, you need to place the transparent cap on the surface of object that you want to shoot, make sure you don’t block your light source and keep 2–3cm distance from the shooting object. The CPL lens can reduce the reflection light, increase the image contrast, it makes image more clear, transparent. This entry was posted in Discount Photography and tagged Android, Camera, Edge, Edge/S6, Galaxy, iPhone, lens, Phone, Plus+, S7/S7, Samsung, Smart by Ball Photo. Bookmark the permalink.